Lawrence B. Lindemer was born in Syracuse, New York, in 1921. He first attended Hamilton College in New York but then transferred to the University of Michigan. He married Rebecca Gale in 1940 and had two sons. He graduated from the University of Michigan with an A.B. degree in 1943. During World War II, Lindemer served as a Second Lieutenant with the Army and the Air Force. Following the war, he returned to the University of Michigan Law School where he received an LL.B. degree. He entered practice in 1948, but immediately became interested in politics. He served as Assistant Prosecuting Attorney for Ingham County in 1949 and 1950. From 1951 until 1952, he served in the Michigan State House of Representatives. Lindemer moved to Washington, D.C. for two years to serve on the Hoover Commission from 1953 until 1955. In 1955, Lindemer joined the firm of Foster, Foster and Campbell. He was also the chairman of the Republican State Central Committee from 1957 until 1961. 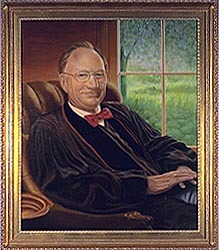 Lindemer was appointed to the Michigan Supreme Court upon the death of Justice Thomas M. Kavanagh. Following his work on the Michigan Supreme Court, Lindemer worked as general counsel for Consumers Power Company. Later he was employed with the law firm of Foster, Swift, Collins and Smith, P.C.